The Odysseia: Dangerous Driving, Saudi Diet-watchers and Anyone Misplaced an Apostrophe? Dangerous Driving, Saudi Diet-watchers and Anyone Misplaced an Apostrophe? For Christmas a year or so ago, I was given a book called Eats, Shoots and Leaves, an amusing commentary on grammatical correctness. It dealt with the confusion that can result when punctuation is either left out or added incorrectly. In an entirely readable manner, it explained such things as the Oxford Comma, making it seem as plain as the nose on your face to those who had either never heard of it, or just never grasped it. I often think of Eats, Shoots and Leaves as I’m driving round and about Riyadh. In particular, it’s the errant possessive apostrophe which makes me smile. Take this for instance. 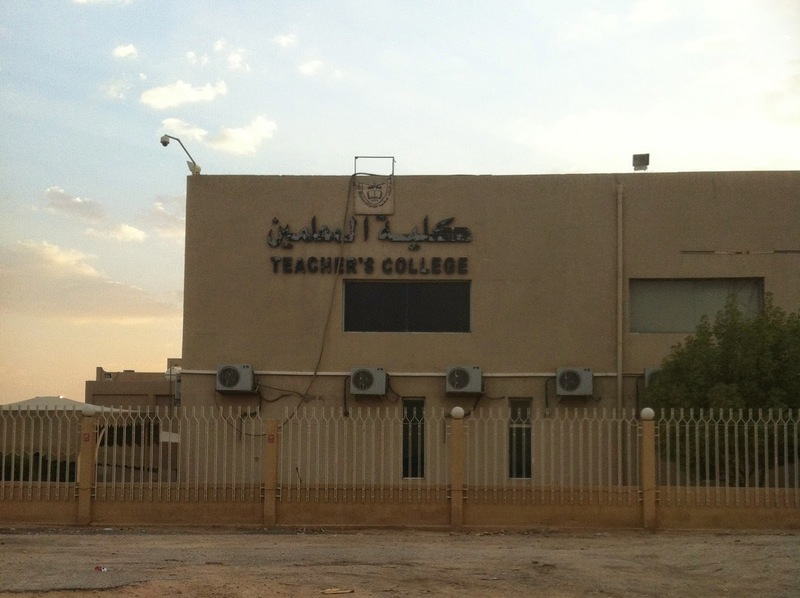 A college for just one teacher? Surely not. Moreover if there’s a grammatical mistake made on the front of a building which purports to be a model educational infrastructure - training teachers for goodness sake – what does it say about the standard of literacy within? Best not to think about it, I tell myself as the lights in front of us turn green and we drive on past this grim façaded building. Then there’s my growing collection of oxymorons. An oxymoron is a small saying which places two opposites together. Shakespeare coined the well known oxymoron, “Parting is such sweet sorrow,” in Romeo and Juliet. As in many other areas of language, his was the masterful touch. But, back to Riyadh and a far less masterful touch with language. You don’t have to be in Riyadh long before you realize the traffic here is endemically atrocious and there is no model of excellence emanating from any driving school. When my husband first arrived and had to sit his driving test it was pretty straightforward. “Drive down that road for about 10 metres and then reverse back,” he was instructed. That was it. Well with a test like this, one may as well be given one’s licence in a cornflakes package. (But I should add, just for interest, that while he passed, the person before him, sitting the same test, had just failed. Impressive.) And so with no rigorously taught road code and no correspondingly stringent testing, the driving here just continues to get worse. I’ve had to tell my driver not to go through the red lights. We’re becoming used to seeing cars driving towards us on single-laned carriageway. Then there’s the triple parking along the motorway on Fridays by any mosque that happens to be nearby. Or cars veering all over the highway because the driver has given his seat and steering wheel to his small son. (Never mind that he’s too little to actually see over the wheel.) Or drifting in the middle of busy traffic. Such dangerous practices are common and acceptable here. So model driving school? No, just another oxymoron. This is no doubt a noble sentiment but most decidedly not something that has anything to do with Saudi. With Cinnabons, and Krispy Kremes being pretty much the national food here, and 25% of the population being diabetic, Saudis are most decidedly not diet watchers. Just sit in any food court and count the number of clinically obese adults and children who walk, or rather waddle past. It’s terrifically sad but what’s sadder is that the problem is not being addressed. So Dietwatching? No, not happening. Where do I start with this oxymoron? I guess it depends on how you define vision. I ‘d like to explain it as a hope for the future, one that’s progressive and innovative. Well yes, you can certainly see evidence of that kind of thinking. The new Metro is an example. No matter that it really should have happened many years ago, or that Riyadh’s never had any form of public transport, or that traffic is more of a cataclysmic disaster than ever now, because of all the excavating. I no longer live in Riyadh, I live in a construction site, and every day brings new dangers and diversions. This is life on a cliff edge: absolutely literally a cliff edge, when we drive down Saledin Road beside its increasingly yawning chasms. So if there’s any vision for women here it’s backward looking. Backward vision? Surely that’s another oxymoron. My husband however, has just informed me that backward vision's a good thing. This is because it allows him to use an on ramp to exit the motorway just like all the other Saudi drivers alongside him. I suppose, like everything else, it's all a matter of perspective.